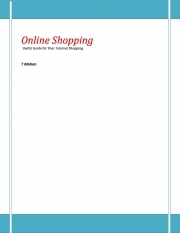 Description of "Online Shopping (eBook)"
All that you should know about online shopping .....An. Useful book for knowing the methods and means for your day-to-day purchases or transactions online.....A Must for all readers. Ex-Banker writing books on topics that are useful for daily life. Reviews of "Online Shopping (eBook)"